Emily Anne King is a New College of Florida student who is completing an internship with SBEP this semester for the course "Writing for Nonprofits." It’s that time of year again. My classmate is referring to the seasonal bloom of bioluminescent microorganisms that turn the campus bayfront into an interactive light-show. If the water is still, one might not notice anything different about the Bay. Movement triggers a blue-green glow, the product of light reactions within countless dinoflagellates Dipping a finger or toe in the water causes a twinkling, blue glow around your skin. Fish and other organisms moving in the water are outlined in this same magical glow. Splashing sends sparkling water droplets airborne. The occasional passage of a boat sends out a glowing wake. In marine areas that are more turbulent than Sarasota Bay, the tumultuous waves might form lines of blue-green light along the wave caps. The beauty of this transient phenomenon inspired a group project on bioluminescence in my oceanography class. I learned that the organism creating this glow is named Noctiluca scintillans, a one-celled algae of a relatively large size for a plankton. Each plankton has a tentacle and a flagellum. 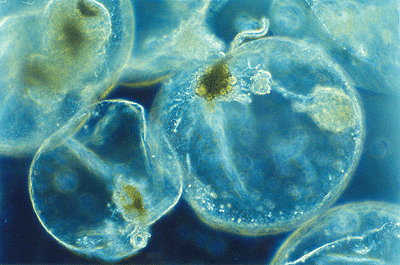 Noctiluca are the largest unicellular protists, or dinoflagellates. Within each plankton are thousands of scintillans, the organelles that gives the organism its characteristic glow and happens to be the species name. Sometimes the cells collide with one another, creating pinpricks of light and reminding one of their common name: sea sparkles. Sea sparkles, or N. scintillans, most likely sparkle for defensive purposes. They glow when disturbed and said disturbance could be a copepod or other plankton attempting to eat them. The glow might serve to either deter the predator from eating it or protect other N. scintillans by continuing to glow inside the predator, increasing the predator’s chances of being consumed by a larger predator. 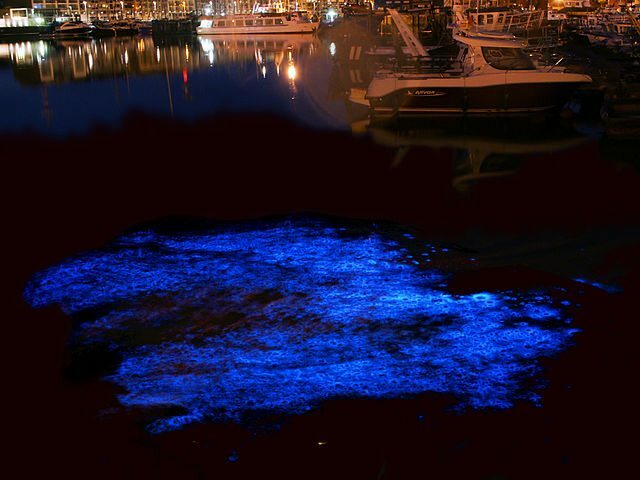 Mass blooms of Noctiluca scintillans have been observed for centuries and called milky seas or mareel. They are found in coastal and estuarine environments worldwide. Blooming events have been large enough to be photographed from space. In this area, bioluminescent blooms usually occur in the fall, after the rainy season. They may appear due to a combination of factors: excess nutrients in stormwater and urban runoff, a mixing event such as a tropical storm, upwelling, and warmer waters. Similar conditions foster red tide and other harmful algal blooms. Therefore, N. scintillans are associated with red tide events although their role in fish die-off events are not understood. Red tide organisms are also dinoflagellates but do not belong to the genus Noctiluca. N. Scintillans are nontoxic although they accumulate and secrete ammonia which can contribute to fish die-offs. Heterotrophic Noctiluca scintillans obtain energy by stringing a line of mucus from their singular tentacle to catch food such as diatoms and microscopic larvae. You might be wondering, “How does a one-celled being consume food?” Their ingestion process is called phagocytosis: The cell opens at the point of contact with the prey and closes again with the prey inside. N. scintillans have the ability to become photosynthetic through symbiotic associations. N. scintillans can internalize prasinophytes, a green algae, which continue to photosynthesize within the cell vacuoles and share energy with the host dinoflagellate. When these endoymbiotic relationships occur, the N. scintillans take on a green color from the chlorophyll. Can they swim with one tentacle and a flagellum? While they are largely drifters, N. scintillans can change their depth in the water column through alteration of the ionic charge of their ectoplasm. They are buoyant organisms and typically reside near the surface. Swimming in the bioluminescent waters is discouraged for a number of reasons: the presence of harmful algae is likely and could irritate the skin and eyes, the glow associated with swimming motions would attract more attention to oneself, and sharks are most active during the night.